(VACNE) - In the afternoon of April 12, 1818, in Hanoi, the VACNE held a ceremony to announce the book "Green Economy for Sustainable Development in the Context of Climate Change", compiled by theVACNE Composers, printed and Released by the National Politics Truth Publishing, in front of numerous VUSTA leaders and the media. This is the result of more than a year's hard work of 24 scientists and practitioners, including one South Korean author, led by the VACNE, from the suggestion of Deputy Prime Minister Vuong Dinh Hue, at the meeting on the occasion of the forum "Green Economy for Sustainable Development 2016" organized by the Association. The book is elaborately and beautifully presented on paper (16 X 24 Cm). With nearly 700 pages, divided into two main sections, including 7 chapters, more than 60 indexes and appendices, the book "Green Economy for Sustainable Development in the Context of Climate Change" by the VACNE conveys a relatively systematic theoretical and practical issues of green economic development, which public opinion is concerned. Not only convey a systematic way on these issues argues, that the authors also made some comments on the policy and direction of economic development in Vietnam green. In the first part of the book analyzes in depth the greening of industrial production, the greening of agriculture, the greening of consumption and the greening of urban and rural lifestyles. 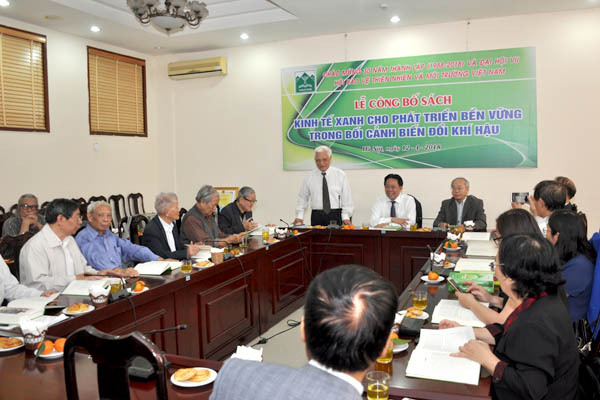 In it, the authors boldly presented his views on many issues, especially the mobilization of resources from the community, to develop a green economy in Vietnam. The second part of this book is an overview of practical models in the world, including the country towards green economy for sustainable development. This book is aimed primarily at policy-makers and development managers; It is also a useful book for researchers, educators, entrepreneurs. We hope the book is a useful reference for the society in the process of developing the country in the direction of green, sustainable, response to climate change.